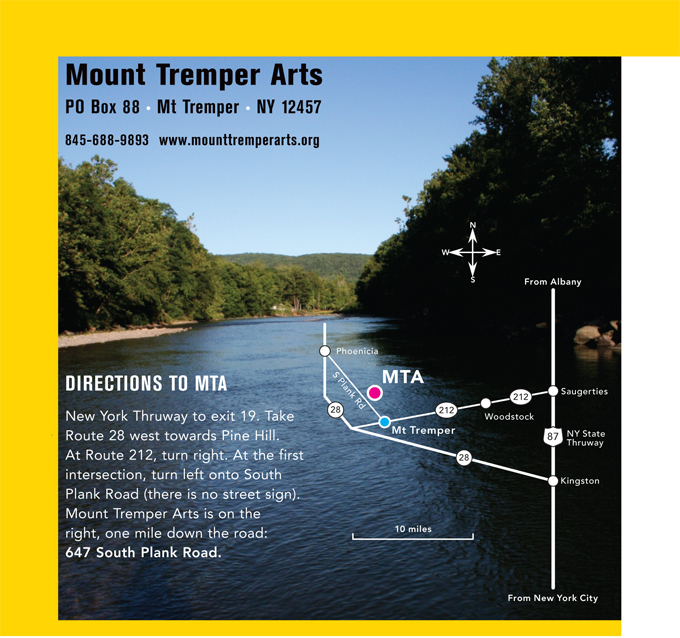 Ask the bus driver to drop you off in Mount Tremper (sometimes its called the "4 Corners" stop). This will leave you right at a small bridge over a river. Beyond the bridge you will see a sign for Zen Mountain Monastery. Go down the road towards the monastery and continue walking that direction, past the monastery, for about one mile. Mount Tremper Arts will be a steep driveway on your right, #647 South Plank Rd. Please note: Our rural road is called by many different names, such as Old Route 28, Old 28, South Plank Rd., Old Plank Rd., and Route 40. Please use these directions as many maps and online routing services do not work here in the mountains.